The fishing scene in South Carolina is one that attracts thousands of outdoorsmen to the state each year. With the Palmetto State’s abundance of popular lakes and rivers, hidden waterfalls and streams, and area guides to show you the way, it’s no wonder that fly fishing is among the state’s top outdoor activities year-round. 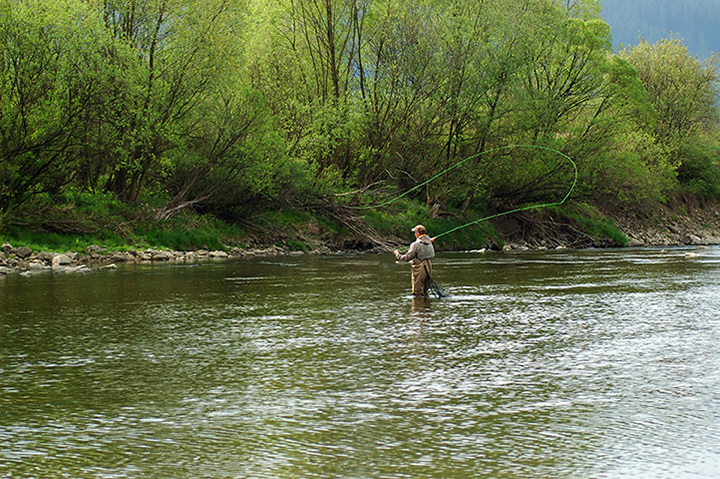 Here are the top five spots where the fish are biting! Flowing from North Carolina to Georgia, the Chattooga River offers some of the best trout fishing you’ll find in the south. Cast your line somewhere between Reed Creek and the Highway 28 Bridge for your best chance at hooking a few. This isn’t an easy spot to get to, but the rewards can be well worth the effort. The bridge offers some access points, as well as Burrells Ford, which sits just below the North Carolina/South Carolina border. The area also offers a few free and low-cost campgrounds to complete your trip, as well as a nearby fly shop. If you’re looking for rainbow or browns, this is your place. However, this spot can get you in trouble if you’re not careful because it sits so close to the North Carolina state line, which means you’ll need an NC fishing license if you cross the border. Head to Duke Energy’s Bad Creek project, where you’ll find a path that takes you to a footbridge. This bridge gives you fishing access upstream or down. If you decide to wade in the water, you should know that about a mile downstream is the Lower Whitewater Falls, while a mile upstream leads to the North Carolina border. This little tailwater of Lake Murray sits west of Columbia. Much of it remains on private property, but there are a few public access points, such as Saluda Shoals Regional Park on the north side or Hope Ferry Landing on the south SCDNR feeds Lake Murray with over 40,000 trout each year, with your best chances of catching a few happening in November through April. For saltwater fly fishing, redfish is the prized catch at Winyah Bay. Redfish can be found in abundance near the shore when the weather turns cool in autumn while they escape the jaws of hungry dolphins. Trout, tarpon, flounder and cobia are also popular targets for fly fishermen. The area is well known for its destination as a fishing locale, so there are plenty of charters available to take you to some of the best fishing spots in the bay. Redfish are teeming in the salt marshes in and around the Charleston area. Given the city’s complex and abundant network of waterways, there are about as many directions to go as there are fishermen. Your best chance is to stay in shallow spots near the shoreline, feeder creeks, marshes, and mudflats during low tides. View more South Carolina Fishing Holes.